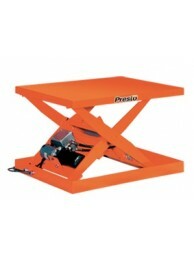 Presto Light-Duty Scissor Lift Tables are the perfect choice for a wide variety of intermittent or occasional use applications. Choose from manual foot pump operated or electric powered models. Popular products are Always in Stock and can ship in one week. A 1/3 HP electric motor adds the convenience of power lifting to this intermittent duty cycle hydrau.. The XS24-10 is a 1/3 HP electric motor that adds the convenience of power lifting to this intermitte..